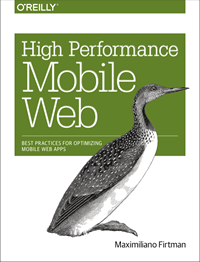 Taking advantage of my conference “High Performance Mobile Websites”, today at Velocity 2010, and a month before my book “Programming the Mobile Web” is published, I start this blog about mobile web development. I hope to be useful for many of you, providing tools, links, tutorials, code and samples to deliver the best possible mobile web experience to each device in the market. Follow me on twitter or follow this blog’s updates. I look forward to your posts, learned a ton from your talk and was great to meet you in person.